The DISPLACE project develops and provides a platform primarily for research purposes to transform the fishermen’s detailed knowledge into models, evaluation tools, and methods that can provide the fisheries with research and advice. The model intends to serve as a basis for decision support tools for (fishery) managers. Among other goals, economic benefit of stock replenishment and sustainable harvesting can be demonstrated. This contributes to evaluate the combined ecological and economic impacts of fishery management before its implementation (i.e. impact assessment). An individual-based model (IBM) on a per-vessel basis covering several fisheries and stocks is a benchmark tool capable of integrating fishermen’s decision-making processes when they face changes in fishery management, economic factors influencing the fishery, economic viability, and underlying stock conditions, including spatial and seasonal patterns in resource availability. 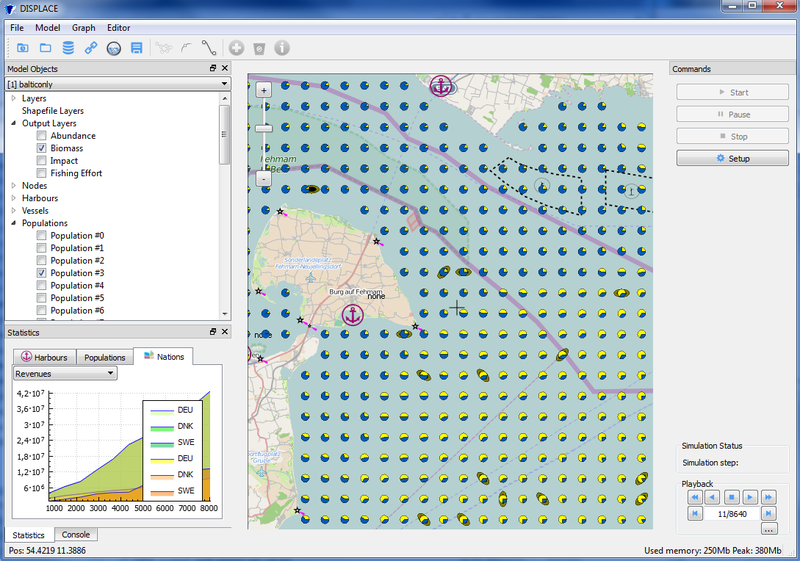 The project allows contributing to marine/maritime spatial planning for e.g. evaluating the effects of smaller and larger marine area restrictions on stocks and fisheries, i.e. impact assessment on stocks and fisheries of broader marine management. The economic evaluation includes evaluation of spatial restrictions for the fishery with particular emphasis to test if there are any economic benefits or consequences from different area restrictions caused by e.g. renewable energy, conservation, etc. Also it evaluates whether these benefits compensate the additional costs of the effort displaced to surrounding or new areas, i.e. the bio-economic consequences of fishing effort displacement. This ultimately incorporates other utilisations of the sea such as energy production, transport, recreational use, etc., e.g. offshore windmill farms, large marine constructions, NATURA 2000 areas, transport routes of commercial shipping, pipelines, cables, etc.